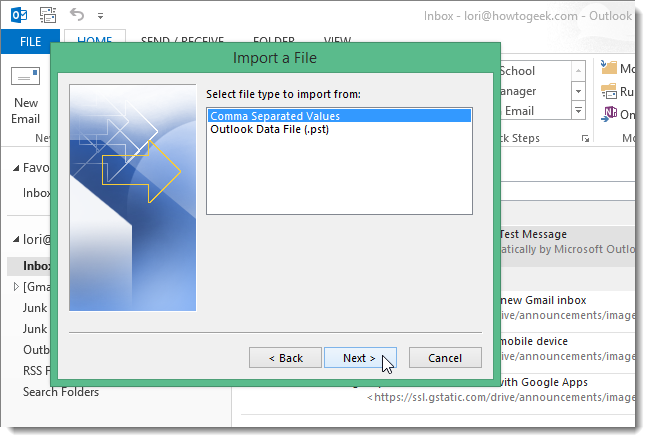 Many of them may have problem to import multiple contact stored in a single .vcf file into outlook 2013. when you try to import that file into Outlook, only the first contact will be imported. 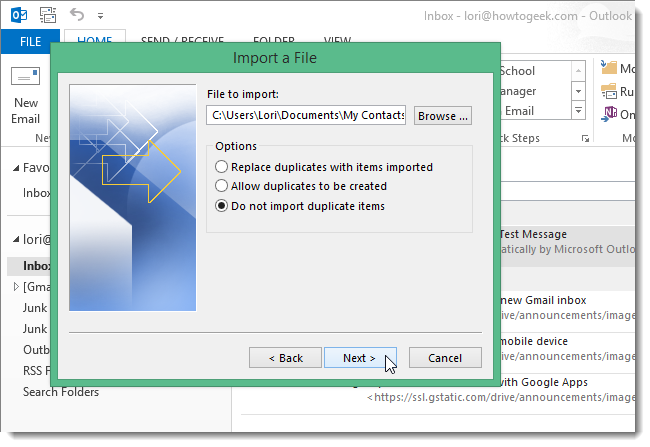 Here is a way to import all contacts from a single .vcf file. 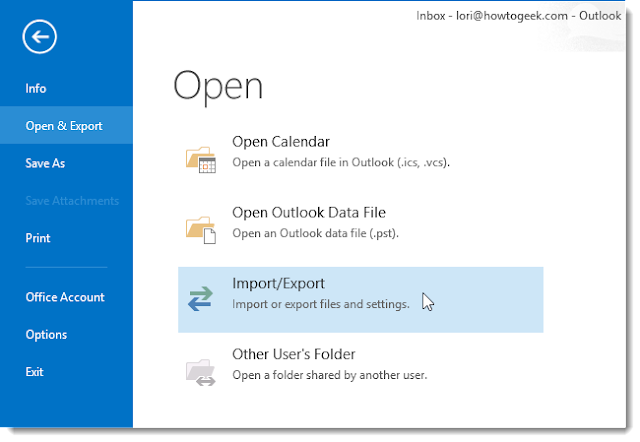 Convert the .vcf file to .csv file that can be imported into Outlook. This can be done using the Windows Contacts folder that has been available since Windows Vista. 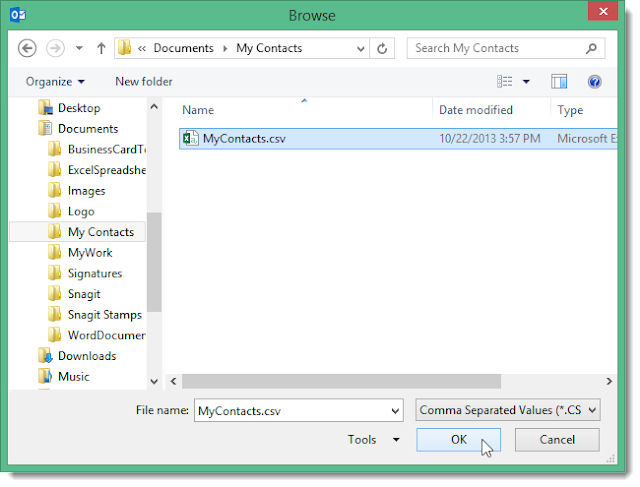 You can import the .vcf file into the Contacts folder and then export the contacts into a .csv file. After converting .csv file, open Outlook and click the File tab. On the Account Information screen, click Open & Export in the list of options on the left. On the Open screen, click Import/Export. 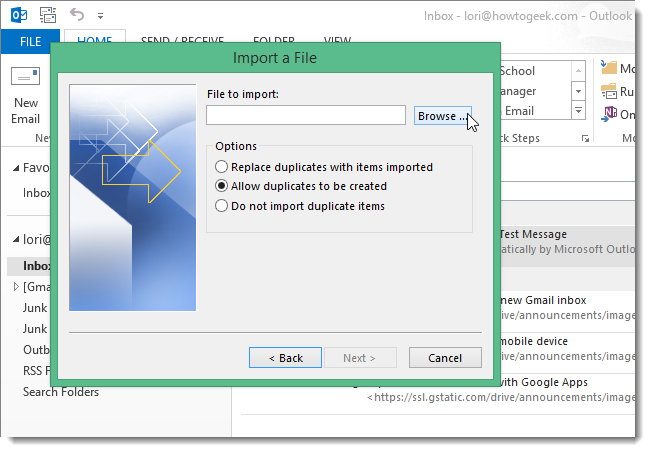 On the Import and Export Wizard, select Import from another program or file from the Choose an action to perform list. Click Next. On the Import a File dialog box, select Comma Separated Values from the Select file type to import from list and click Next. On the next screen, click Browse. 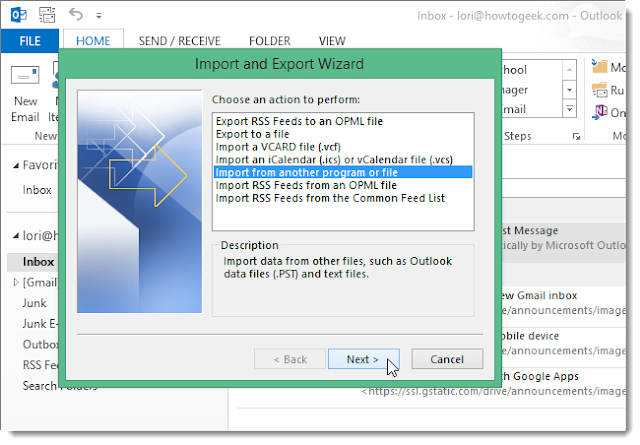 On the Browse dialog box, navigate to the folder containing the .csv file you want to import. Select the file and click OK. Select an option to indicate what to do when duplicate entries are encountered and click Next. 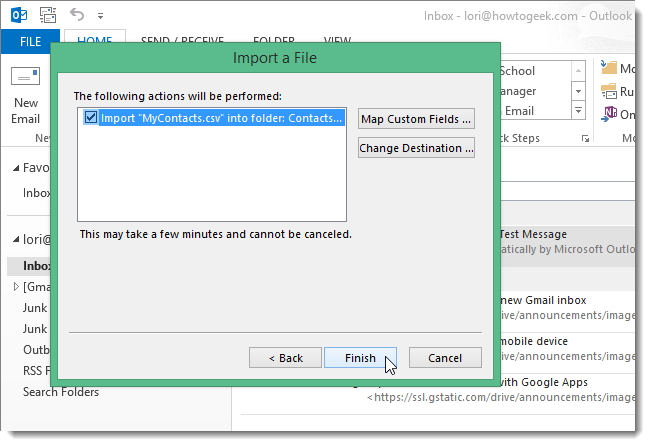 Select Contacts from the Select destination folder tree to specify where to put the imported contacts. Click Next. A summary screen displays telling you what actions will be performed. Use the Change Destination button to change the location in Outlook to which the contacts will be saved. NOTE: The Map Custom Fields button opens a dialog box that allows you to specify which fields in the .csv file correspond to which fields in Outlook. The default mapping is usually sufficient to import the information. 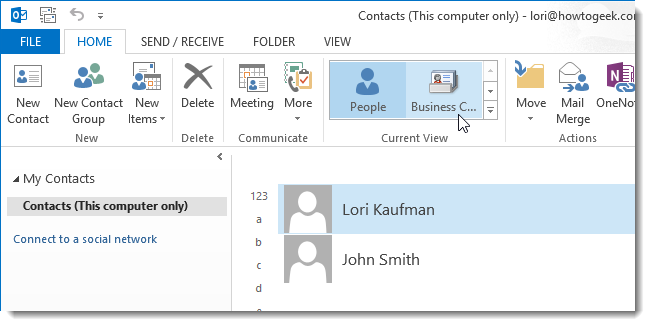 Once you’ve imported the contacts, click the People icon on the navigation bar at the bottom of the Outlook window. 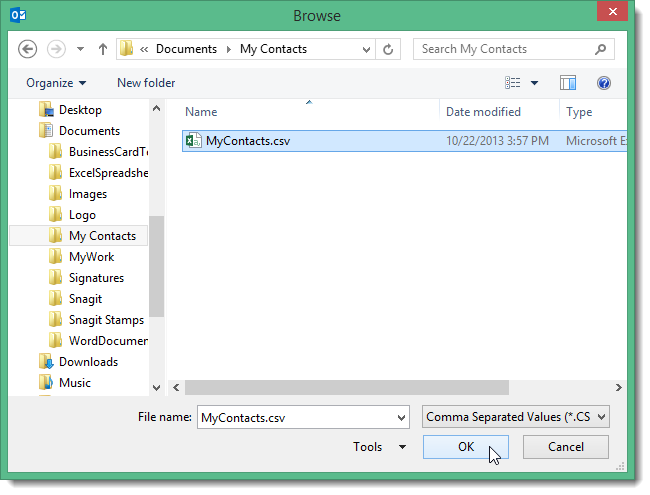 You’ll see the contacts listed in the Contacts folder. You can select a different view, such as Business Card, in the Current View section of the Home tab. If you’re using Outlook 2010, you can import contacts directly from the Windows Contacts folder without exporting them to a .csv file first. vCard Export Import Tool as it is highly tested by the experts before presenting before the users. A safe and smooth result is gained by the software. To know the software more clearly, you can test a free version of the software and know the software in a better manner.